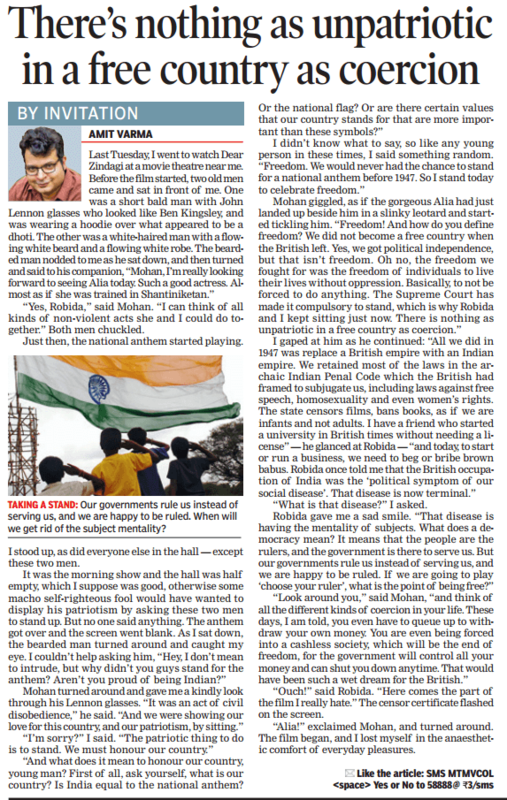 This is a guest column published today in the Sunday Times of India edit page. “Yes, Robida,” said Mohan. “I can think of all kinds of non-violent acts she and I could do together.” Both men chuckled. Just then, the national anthem started playing. I stood up, as did everyone else in the hall – except these two men. “What is that disease?” I asked. “Ouch” said Robida, “here comes the part of the film I really hate.” The censor certificate flashed on the screen. “Alia!” exclaimed Mohan, and turned around. The film began, and I lost myself in the anaesthetic comfort of everyday pleasures.